Detail : Paul's seventh solo single. This was Paul's theme tune for the eighth James Bond film. The film company approached Paul to write a theme for the film with the intention of another artist singing it. But Paul insisted he would only compose a song if "Wings" were the final performers. Up to this point, this was the most successful Bond theme, being nominated for an Oscar (but beaten by the love theme from "Towering Inferno"). Another version of the song is heard over the soundtrack of the film, by Brenda Arnau. 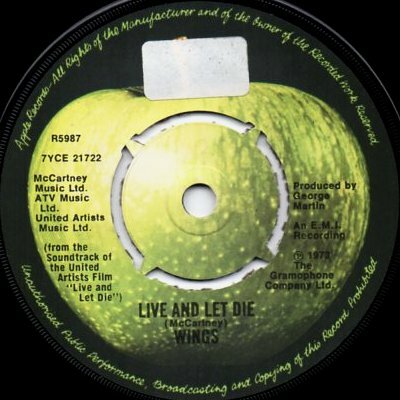 The B-side, written by Paul, features Denny Laine singing lead for the first and only time on a Wings single. Surprisingly, given it's big theme status, the single was not released in a picture sleeve. But once again Paul returned to using the generic Apple label - perhaps due to Klein having departed the business.